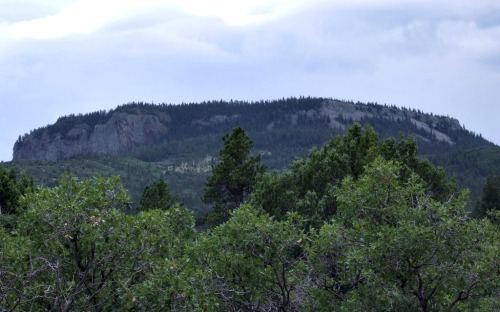 The term Urraca mesa refers to the large mesa formation here. A mesa is a large elevated piece of land that has a flat top, often having steep if not vertical cliffs, and it means "table top" in Spanish. The area has long been the scene of paranormal activity and ghostly stories, which started around the time an Indian tribe inhabited these lands. They were a tribe called the Anasazi who lived here for many generations until suddenly around 900 years ago they disappeared overnight. Evidence has been found of the tribe being brutally wiped out, with many of the skeletons showing signs of torture. Who was responsible for this is unknown, as no evidence that another tribe committed this massacre has ever been found. Long after this tribe had vanished another tribe came into the area, and legend says they sense a great evil presence in the land. This tribe was called the Navajo, and their medicine men tracked the source of the evil they sensed to Urraca mesa, believing it to contain a path to the underworld. After the Navajo disappeared, the area was largely unoccupied as it is to this day. Apart from the odd house or farm there are very few people living here, and today the area is known as an area of outstanding natural beauty, attracting thousands of visitors every year. As you can probably guess any area that used to be inhabited by an Indian tribe is surely going to have a few ghost stories attached to it, and this place is no exception. The first account of supernatural activity here comes from the Navajo, who believed that a great battle between the previous Anasazi tribe and the forces of evil coming out of the portal was fought on top of the mesa. It is said that the entire tribe took part in the battle, with their medicine men managing to seal the portal shut at the last moment with 6 cat totems. The entire tribe was wiped out in the fighting with only a hand full of survivors who either died from their wounds or left the area, never to re-establish themselves elsewhere. The most well known stories of the area come from this battle which was said to have happened here. The 6 totems are thought to hold the portal shut, and should they all fall it would re-open, and today there are only 2 of these totems remaining. People have made claims of seeing other worldly monsters and spirits of Indian warriors atop Urraca mesa, with claims varying wildly from simple apparitions, to the sighting of huge winged beasts souring along the cliff face's. There are also many other stories of other spirits in the area, such as various cowboy ghosts who have been seen here, since the area was used as a rest stop and grazing ground for cattle ranchers. Many other claims from the area seem to include something along the lines of being stalked. People have reported the feeling of being watched on the trails close to the mesa, reporting strange whispering noises and some interesting claims of actually being followed for quite some distance by various animals, past the point of their natural curiosity. There are also many tour guides in the area who refuse to go on top of the mesa after dark, and camping is prohibited on its flat surface at all times, except in certain emergency circumstances. It is very likely that most, if not all of these stories are nothing more than camp fire tales and old Indian superstition, but there are a few to many similar claims made by many people over the years that keep the stories alive, making it one of the most well known haunted places in the state.